Folks have wondered for ages where the unicorns may have gone. Since they appear in all sorts of different cultural legends, it seems only fitting that they must have been around some time. Maybe they got overlooked on that big boat? Of course, with a being that has so many exotic and mysterious powers, it seems more likely that they're hidden in plain sight. Perhaps they're shapeshifters, masquerading around as humans. Perhaps we just need to let them feel comfortable to come out into the open again! Whether you're trying to draw one out or reveal your true form to the rest of the world, this Complete Unicorn Makeup Kit is bound to help you charge into the light of day like the gleaming rainbow creature you are. This makeup kit includes a spiral unicorn horn as well as dark, light, and magenta makeup tones to help you create a radiant umbral look. Accent it further with diamond baubles and you'll feel like legit magic. 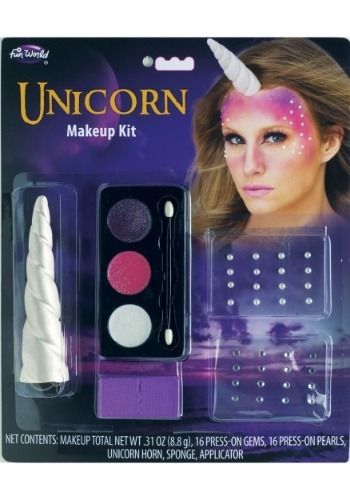 Watch the awe in the faces of all those around you when you strut your unicorn style out thanks to the magic of this Makeup Kit. You'll definitely want to practice those unicorn calls because you'll look so authentic that you might be conjuring the real ones out of the woodwork!